Hamburg: Rowohlt Taschenbuch Verlag, 2006. This is the first German edition of Skeleton Man, and it was published by Rowohlt Taschenbuch-Verlag in Hamburg, Germany. This edition is a part of the RoRoRo Paperback Thriller. 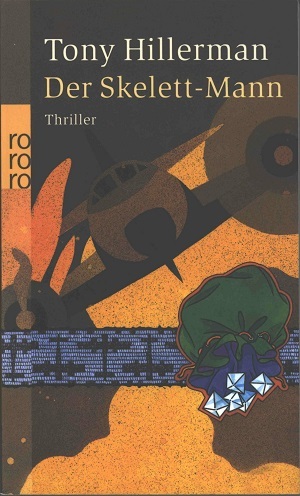 RoRoRo is the first paperback series in Germany, the concept of printing inexpensive paperback versions of popular books was imported from America to Germany in the 1950's. This edition of Skeleton Man was translated from Tony Hillerman's original English text to German by Fried Eickoff. Format: Paperback, 19 x 11.4 cm. Binding: Full-colored paper covers with the author, title, and publisher's logo.